Farmhouse Pillow Cover Just $9.99! Down From $25! Shipped! You are here: Home / Great Deals / Farmhouse Pillow Cover Just $9.99! Down From $25! Shipped! Until February 3 only! 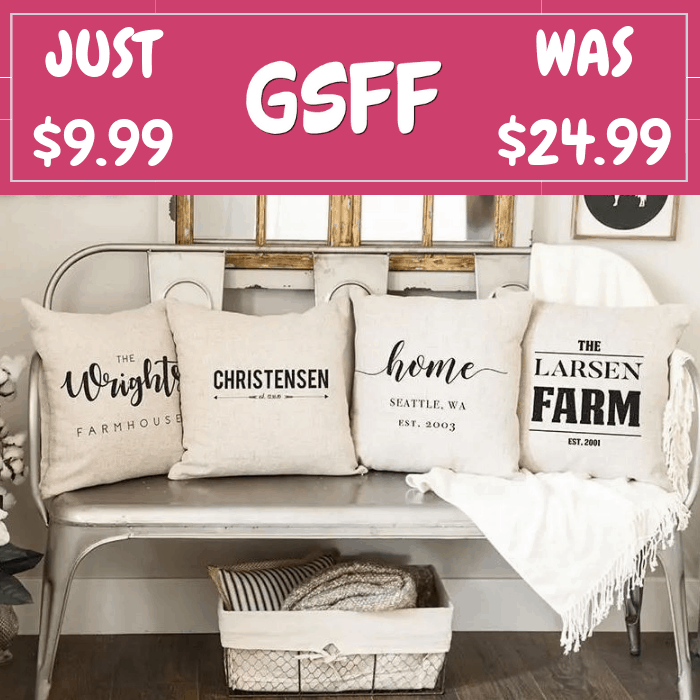 Hurry over to Jane where you can score this Personalized Farmhouse Pillow Cover for just $9.99 down from $24.99 PLUS FREE shipping! Feel the comfort of farmhouse decor right in your own home with these beautiful, personalized home and family throw pillow covers. Created to complement the farmhouse style, these throw pillow covers will add a touch of charm to any modern farmhouse, city, or country home. Covers are expertly printed on high quality, washable fabric and feature a zipper opening on the reverse for a finished appearance and to allow easy insertion and removal of a pillow insert (sold separately). Each one is a generous 18 x 18” and will add a touch of charm to any room. Choose from four exclusive designs and add a surname to personalize it. These make fabulous housewarming and wedding gifts!